After an overwhelming number of requests, it was only fair that I provide an update about my face so everyone can stop pondering their ponders and querying their queries. If you have seen my face recently you may be a little shocked as to the present state and condition of it, so I would respectfully and humbly ask that all of you take a seat before reading the rest of this post. As you can see, the majority of my face is now just a nose. 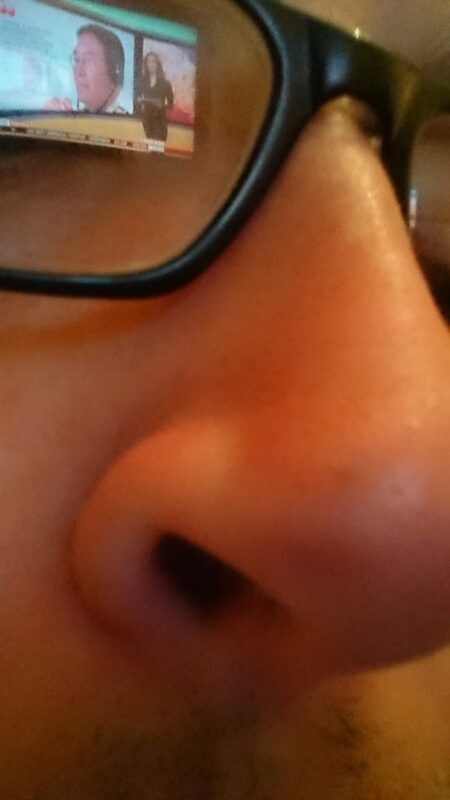 This nose takes up approximately 80% of what used to be my face. Can you even still call it a face when most of it is a nose? Nobody knows. All I know is that things have become a lot more nasal as a result of this. The nose continues to grow at an exponential rate. Scientists predict that within three weeks I will have lost my face altogether. It will cease to exist and only one massive, humongous nose, attached to a pair of arms and legs, will walk around pretending to be me. I will resemble Chris the Cheese but instead of a large block of cheese I will resemble a huge conk, and small school children will haphazardly wander into and up my nasal cavity in the hope of finding their lost kites and skateboards. In addition to this, another shocking revelation is that one of my eyes has been replaced by a BBC news presenter in the middle of reporting an interesting piece about China. This article repeats every seven minutes and whilst it has become a repetitive and somewhat annoying inclusion, it is very informative and has won several awards. Seeing through it is no longer an option; I have taken to wearing an eye patch, much like pop chanteuse Gabrielle, to cover my iron shame. … I should probably go see a doctor. You sir need a lesson in manners. If you don’t desist I will have to call upon my colleague Joog to dish out justice on an unprecedented scale. Is that the same Joog who is currently busy in court related to historical abuse charges towards acorns in the 1990s? We were definitely promised subheadings. Threats centring on this Joog character are all very well but unless he’s bringing a briefcase full of nicely typeset subheadings he won’t be welcomed around here. You see me, right, this is me caving to peer pressure. Okay you sleazes, I’ll make your damn changes. You see you, as in you, right: I see you, as in you, but I don’t see your changes, as in your damn changes, at all. I hope you’re happy. You quilted tracksuit you. Excellent use of sub-headings, however there is still a distinct lack of diagrams. Much better. Still needs work. You have a picture of my face; what other kind of diagrams are required exactly? So what you’re saying is that you want to see more pictures of my face? I’d be surprised if that was the case. Perhaps you could prepare a diagram showing the proportion of people who actually want to see more pictures of your face. Can I have a dream about it instead? It seems like the most simple of the several many options. I’m really good at dreaming at the moment; last night I dreamt I was looking at CDs in a charity shop. I don’t think you’re cut out for this report writing lark. You’re right. I should stick to my award-winning series of books instead. That’s where my strengths lie. Can you still refer to them as books when all that actually remains of them is a large amount of ashes and a contribution to global warming? Oh we’ve had fresh printings of all my books. They’re literally flying off the shelves. You might be able to find one or two at your local Londonesque book store but be quick! When you say “flying off the shelves”, do you mean “leaping to their suicide for the good of mankind”?